Note: I made this while playing on Master difficulty. I'm pretty sure the difficulty doesn't change anything to do with finding this room. But, just incase it does (I doubt it) I'll put this note here. I was going to make this a part of an entire 3-s guide but I'm way too lazy. So maybe someone can just link to this if they make a guide. In 3-s there's a secret room with Golden Goblins. They give legendary drops at a rare rate and lots of other good stuff as well. The higher the difficulty, the better the drops of the other stuff usually is. On the lowest difficulty I normally get the elite purple spark item that's used to make gear and lots of low tier enhancement things. On Master difficulty I normally get the legendary version of that item and green mid tier enhancement things as well as low tier enhancement things. Because of this room, this dungeon is one of the best money makers in the game. This goblin room is found on Route C Orange. You're probably wondering. HOW DO I GET THERE!?!? Well, 3-s is a maze... but it's not really a maze. Everything has a set order. Where you start in that order is determined by RNG. The first choice for a room you have is Route A 100% green and nothing else. That choice randomly puts you anywhere in the order of rooms I have listed below. If you're lucky you can get the Goblin Room in 1 extra room. If you're unlucky you might need 4-5. Obviously you're going to pick 100% Route C orange so I didn't include anything after that. It doesn't matter if you pick green in Route A or Route B. The order is always the same. So just pick whichever Route has a higher chance of green. Any time you choose this 100% Green it'll reset your position on the order again. If you're really lucky you can get 3 Goblin Rooms in one run. I've almost gotten three but I derped right before getting the 3rd one and got an Orange Room on the 80/20 roll. What level is the orange gear exactly? On normal they dropped Lv35 stuff. Since master is Lv46-50 I'd assum it would drop 45 stuff. I haven't found any gear yet though. Meaning the maximum is now 2 rooms, with only 1 possible if you get orange even once. (01-17-2015, 10:47 AM)Nova Wrote: I did the normal version of this, and while I got all 15 rooms and all 5 SWAT officers, it still said Mission Fail. 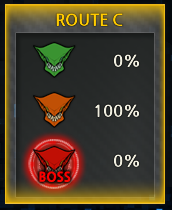 Was I supposed to go to Route C at least once? Outside of the initial side quest, it's pointless to do it though, unless you want the special Booster/Accessory modules, which require 30 and 50 boss drops respectively. The repeat quest is very unrewarding compared to goblin rooms. Is it good for experience though? I'm already finished with the main storyline for Singang, so I need a way to grind so I can get to G Tower already. so even if you are level 39 you can do this right? just not on master difficultry? Yeah I think master requires you to be level 45. 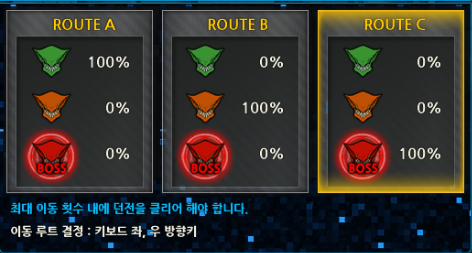 Master gives 3 dolls on perfect complete (2 on regular) as opposed to 2 and 1 on normal mode. Then again you may want to aim for that Goblin room.